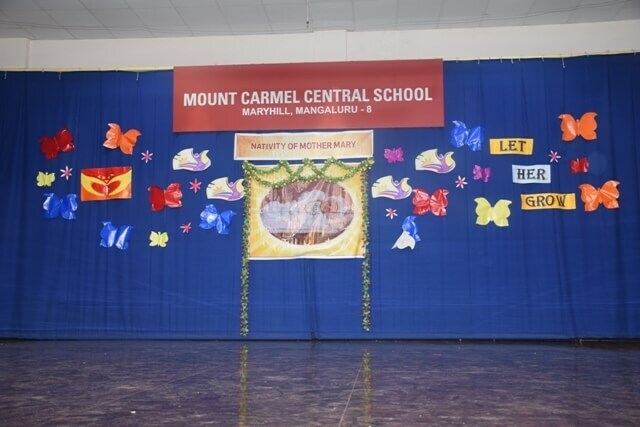 On September 7, 2018, the celebration of the Nativity of Mother Mary commenced by celebrating the Holy Eucharist with faith, hope and gratitude to the Almighty. 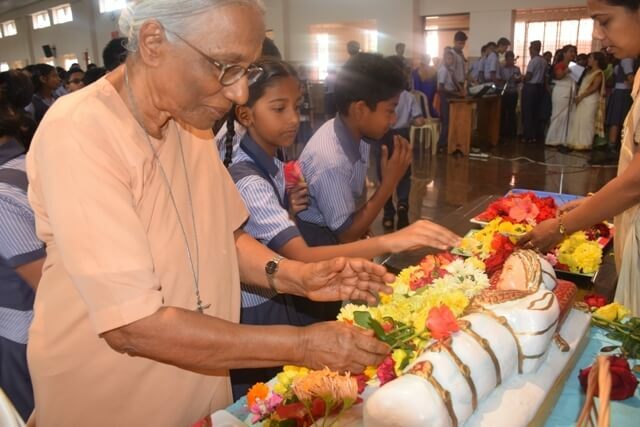 Prior to this day, the catholic students and staff offered Novena prayer daily to Mother Mary from 31st August as a preparation for her Birthday. 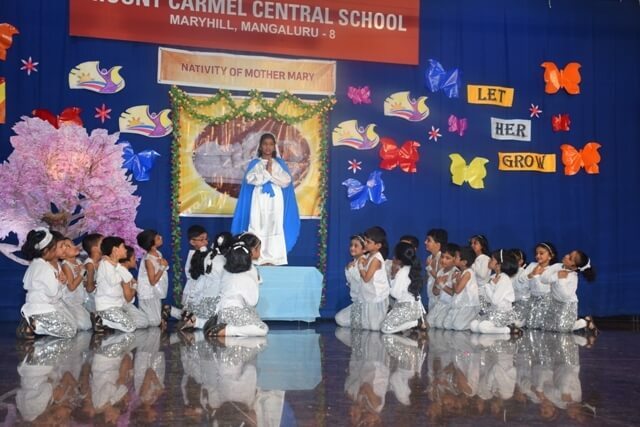 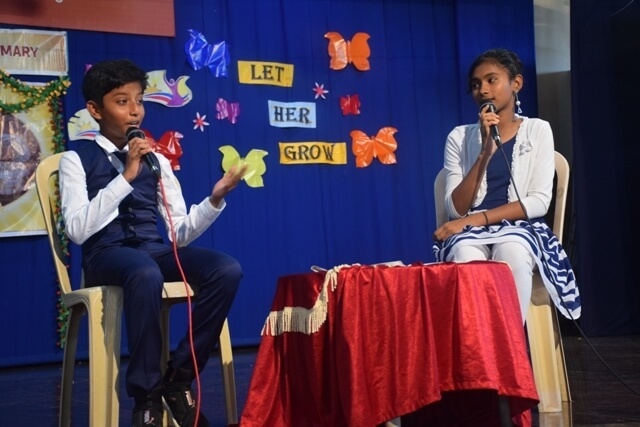 “Mary’s birth brought joy to the world” and “A girl Child brings joy, she is no less than a boy.” With this theme, the students of Class 8 celebrated the Feast of Nativity of Mother Mary and International Girl Child Day. 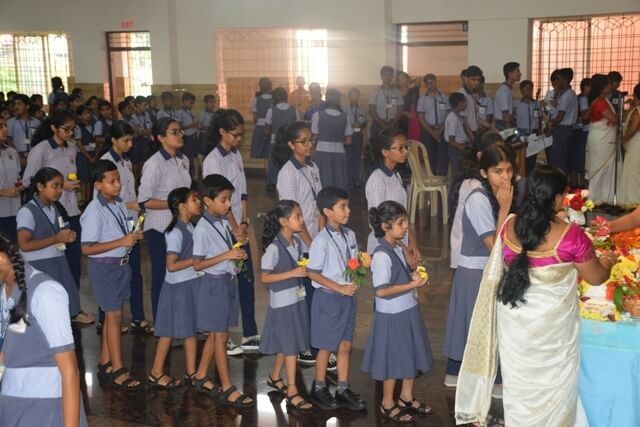 The celebration began with a meaningful prayer service highlighting the virtues of Mother Mary through the acronym ‘girl child’. 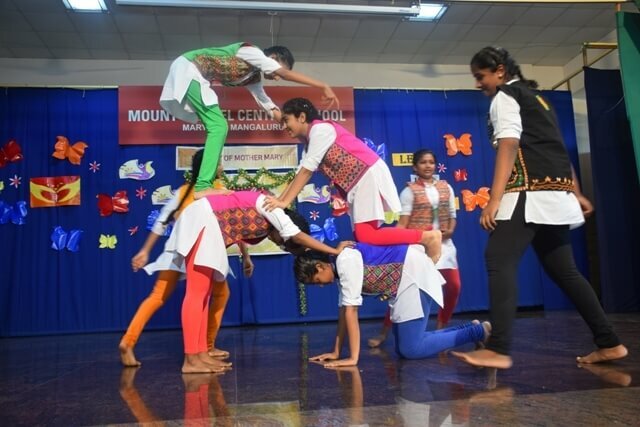 Students extended a warm welcome to the gathering through a traditional dance. 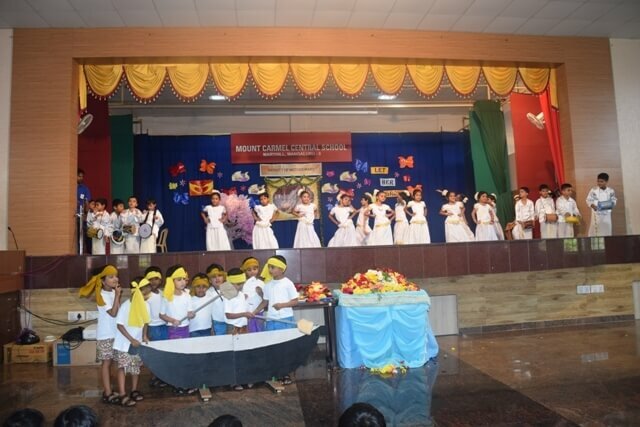 The significance of the day was highlighted through a power point presentation which included the major feasts of the month i.e. 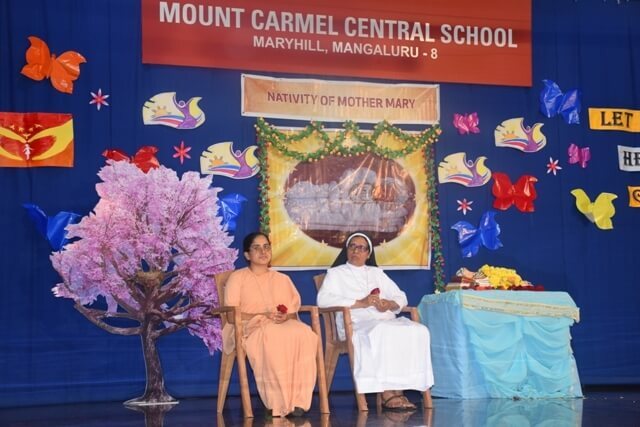 Nativity of Mother Mary, Ganesh Chaturthi and Girl Child Day. 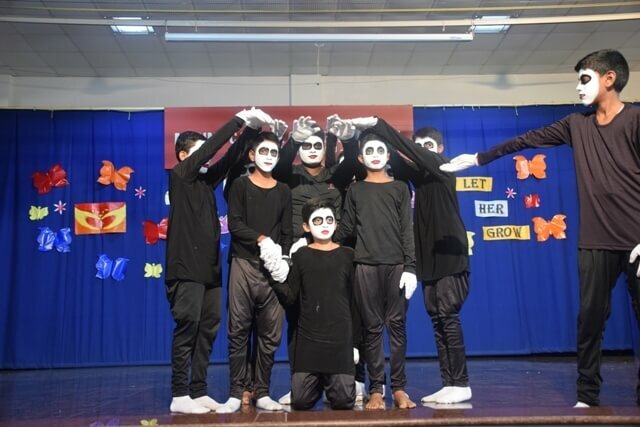 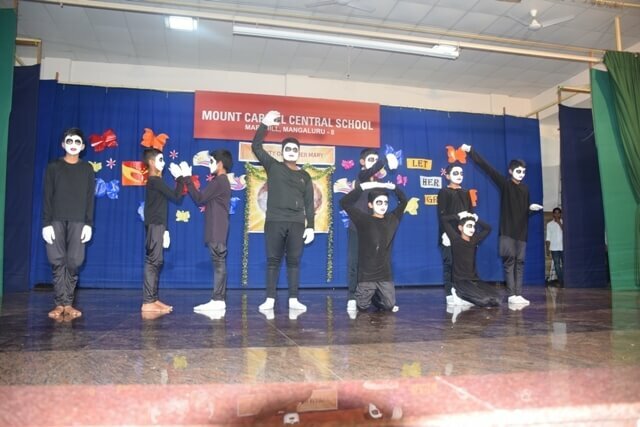 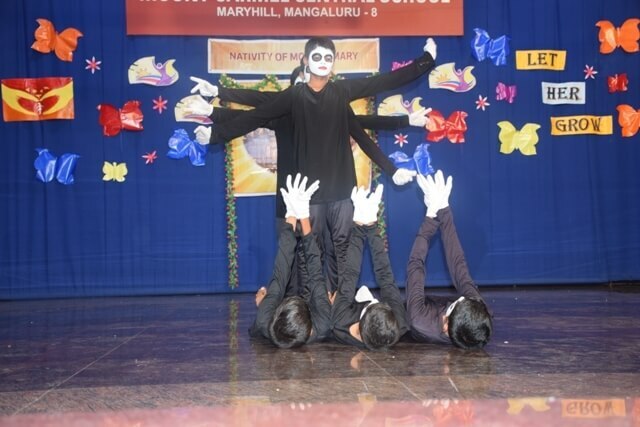 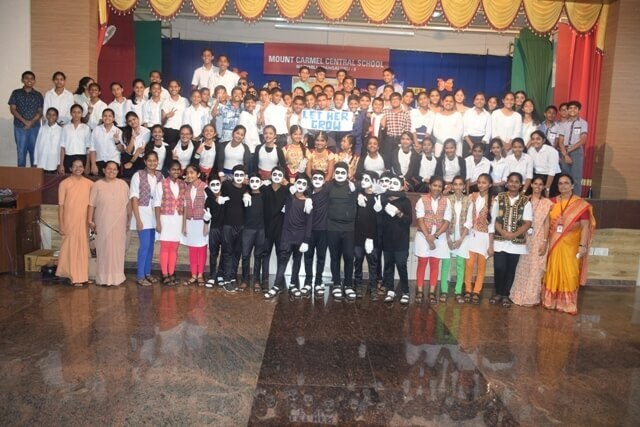 To express the preciousness of the girl child in our society and give her respect and dignity, the older students presented a mime show and a skit which brought out the theme “Let her grow”. 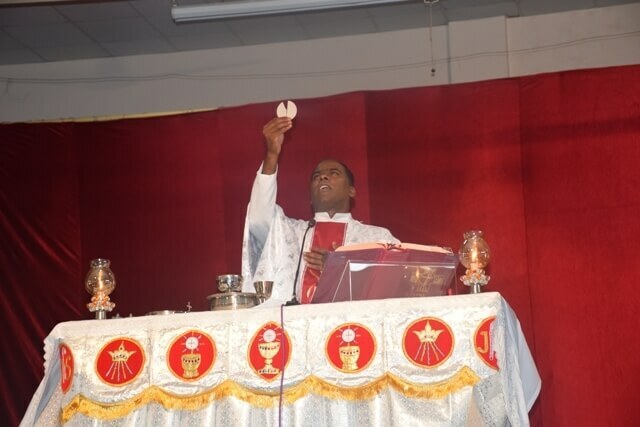 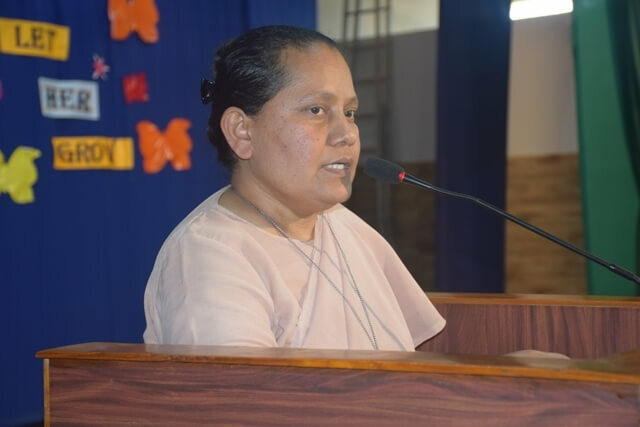 Principal Sr. Melissa shed awareness on the importance of the feast of Nativity and the Girl Child. 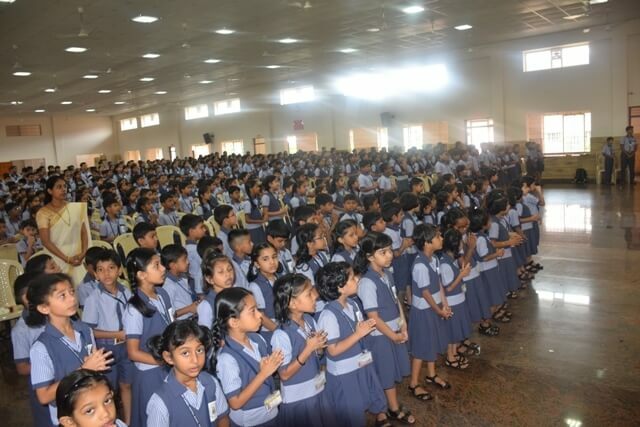 She also conveyed the message of upholding the dignity and rights of the Girl Child. 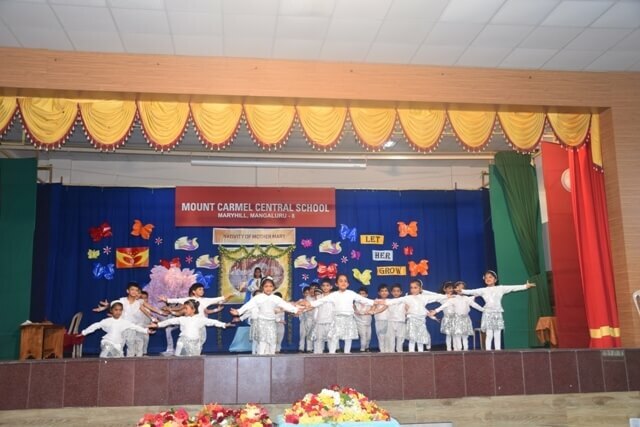 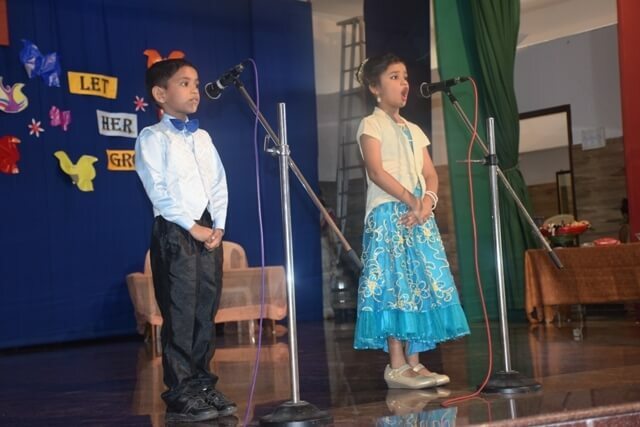 The tiny tots of UKG and students of class 2A had the privilege of hosting the programme for the kindergarten and lower primary section. 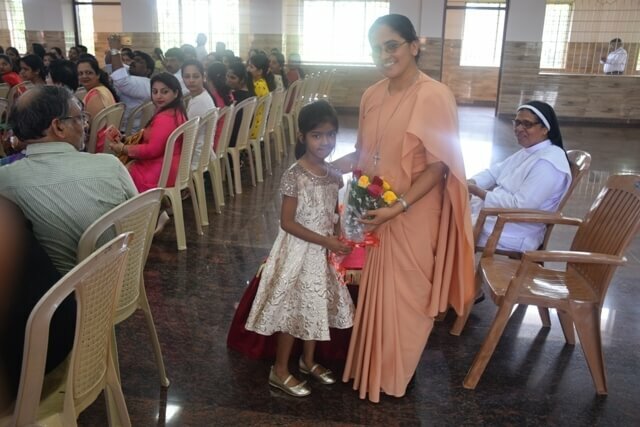 The beautiful day of celebration, commenced with a prayer dance, unitedly invoking God’s blessings. 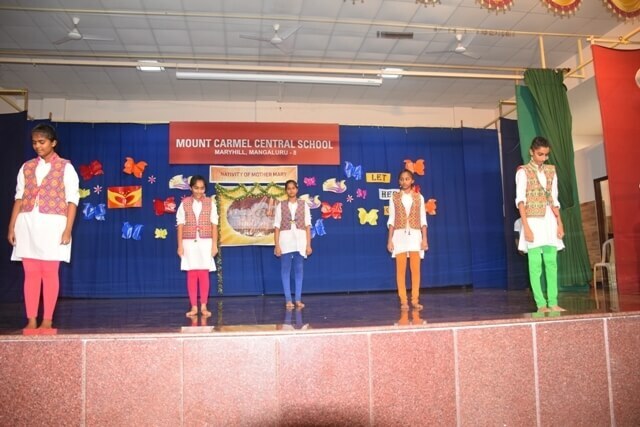 The students welcomed the gathering with a graceful dance and warm words. 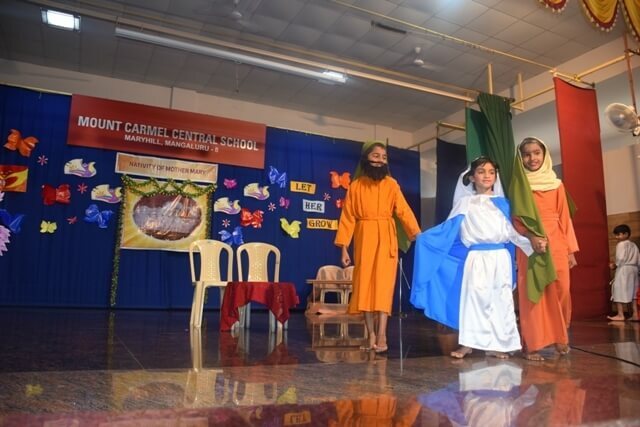 A skit highlighting the birth, life and spiritual journey of a little girl ‘Mary’ was well performed by the characters and appreciated by the audience. 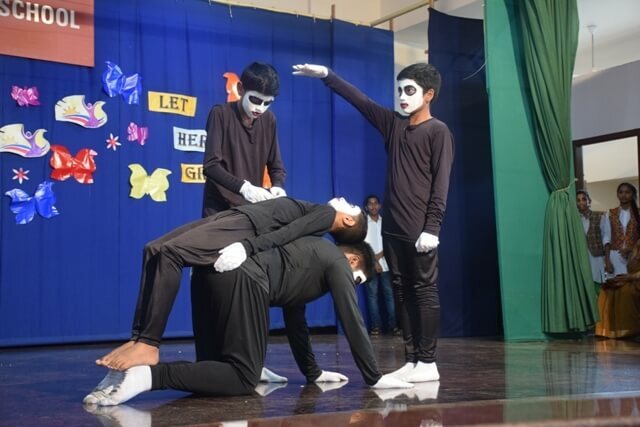 The skit being prayerful and powerful, the audience watched with rapt attention and drawing inspiration from the act. 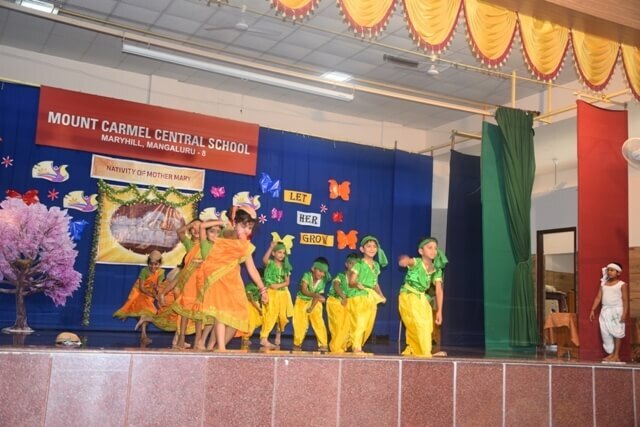 The famous Suggi (harvest) dance reminded us all of our rich culture and the traditional ways of harvesting, making it a part of Incredible India. 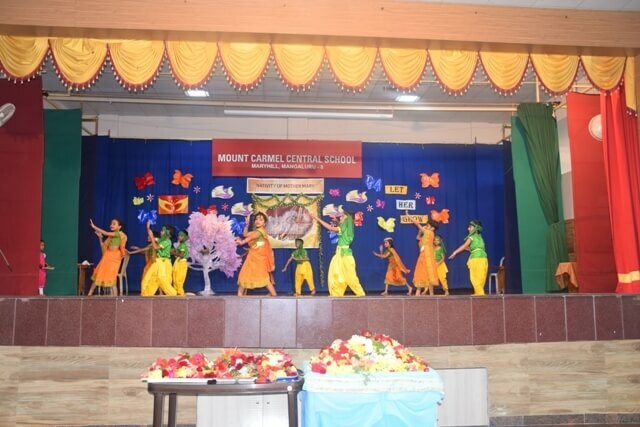 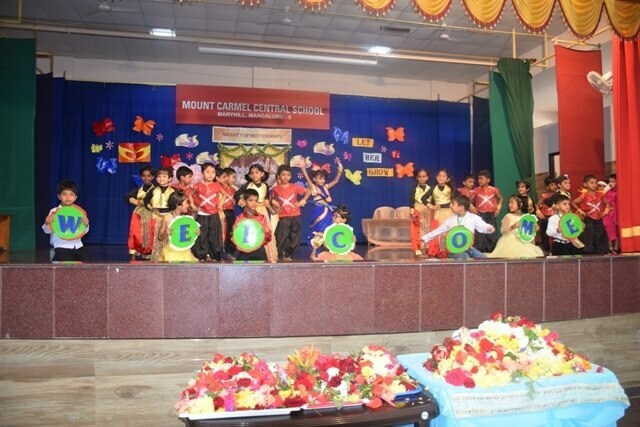 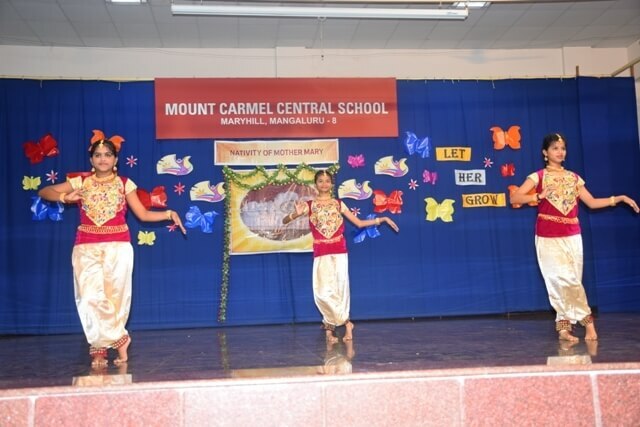 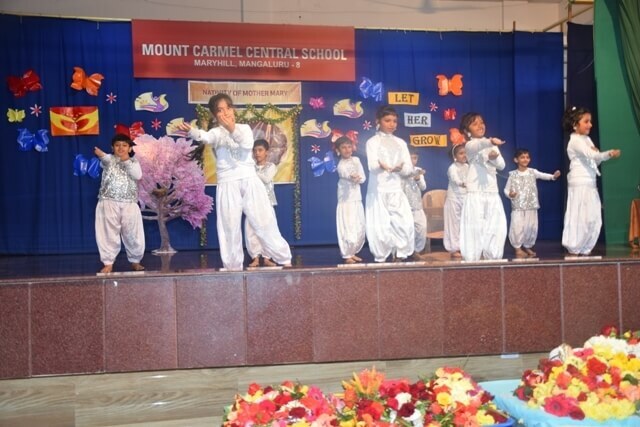 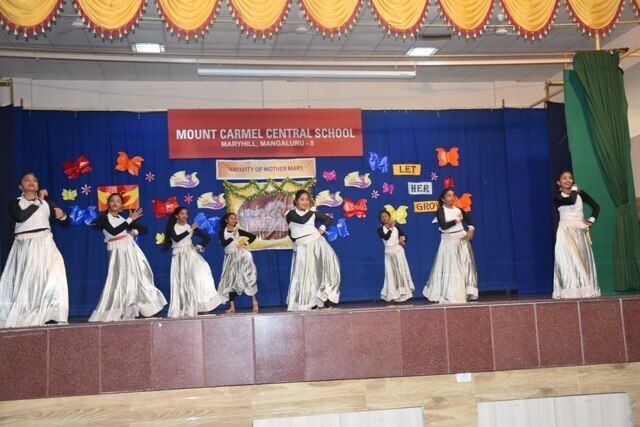 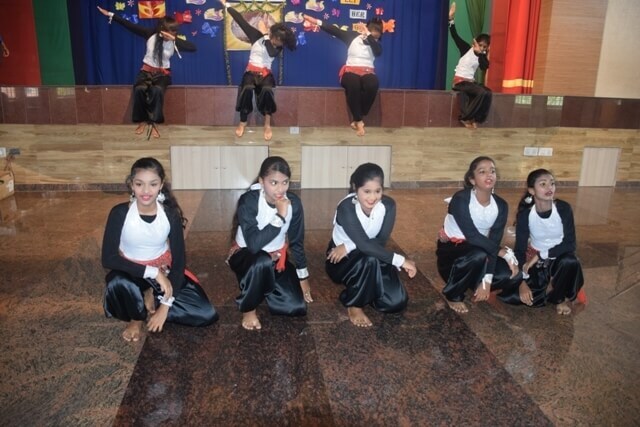 To make the event more exciting and joyful, the students conveyed their happiness through an energetic celebration dance which really kept the audience spell bound. 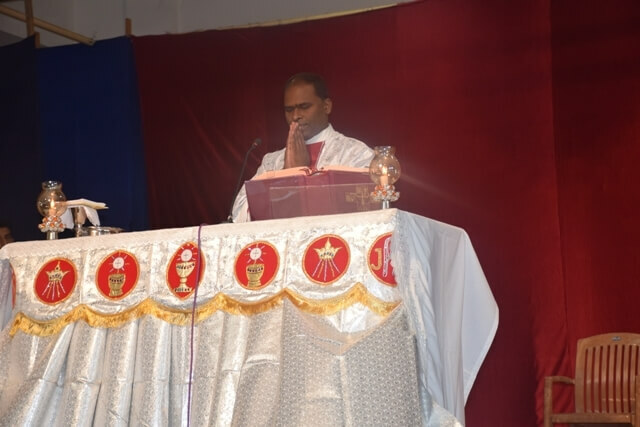 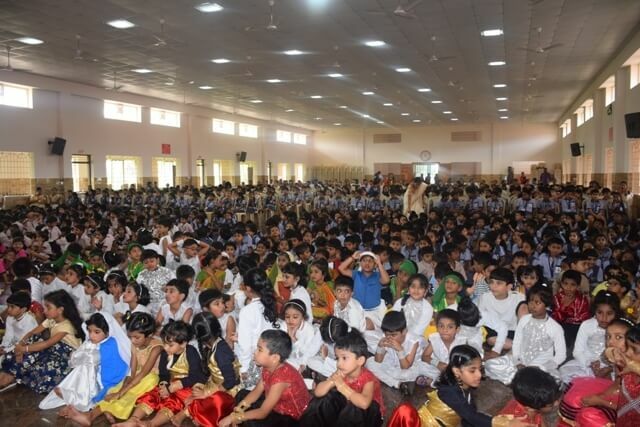 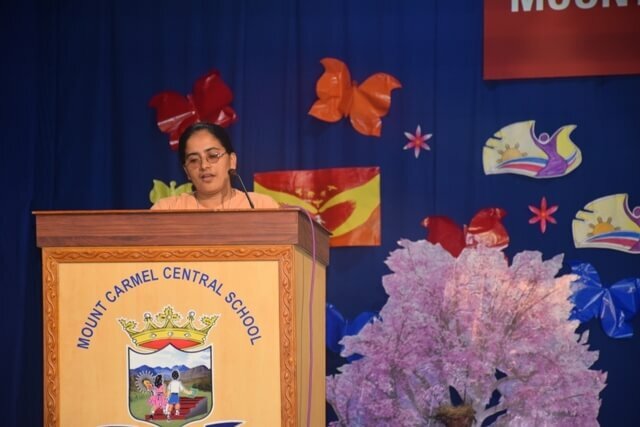 The Chief Guest, Sr. Reshma DSouza wished everyone a happy feast of Nativity of Blessed Virgin Mary and told the students to inculcate the virtues of Mother Mary. 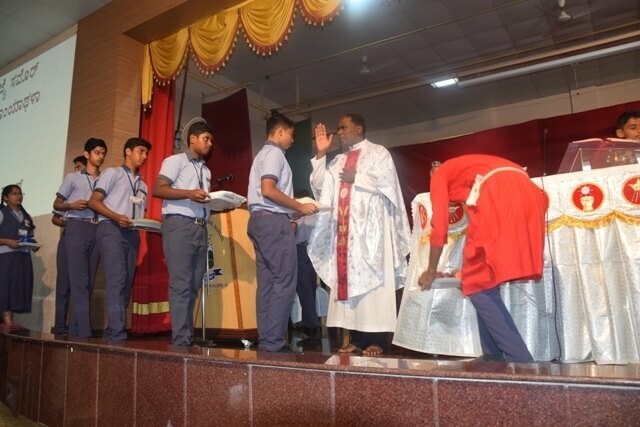 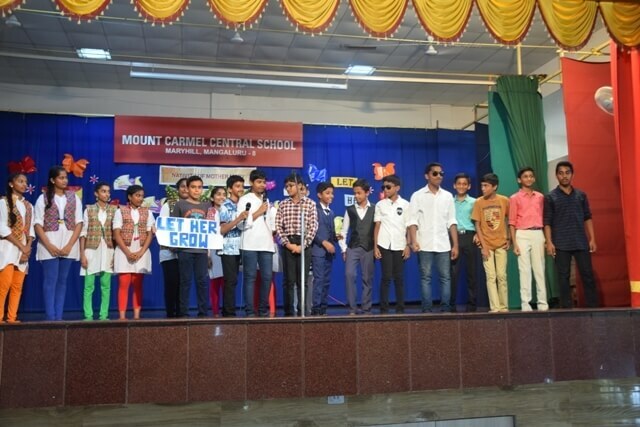 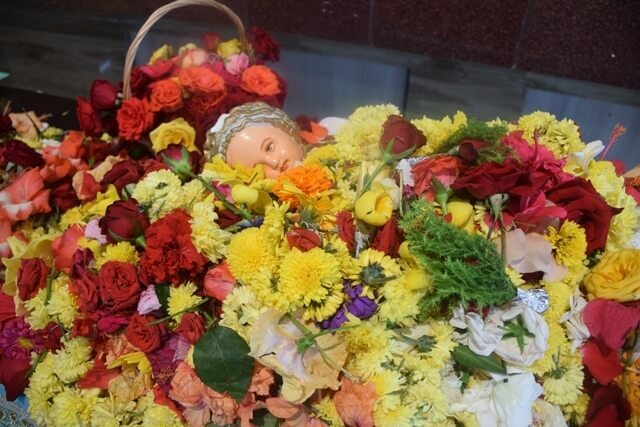 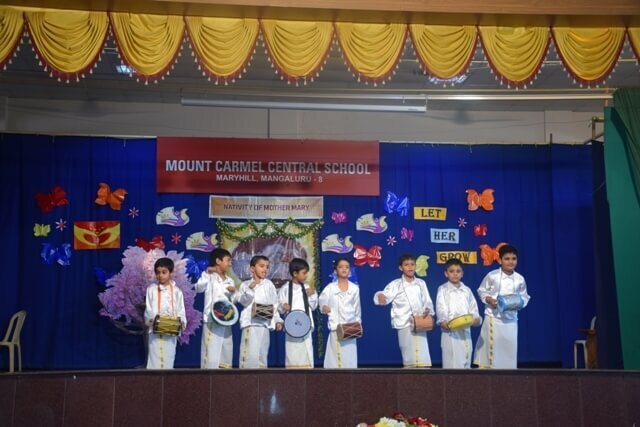 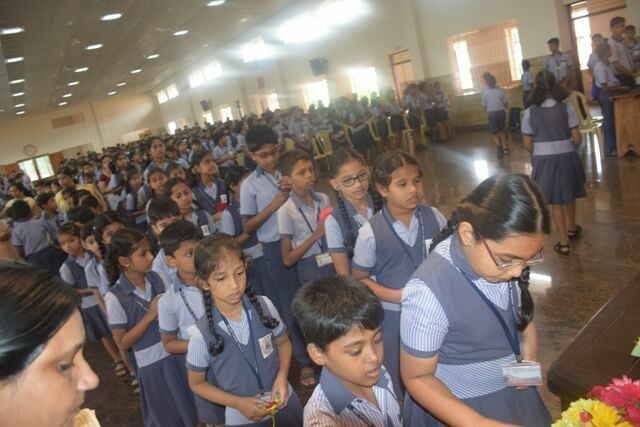 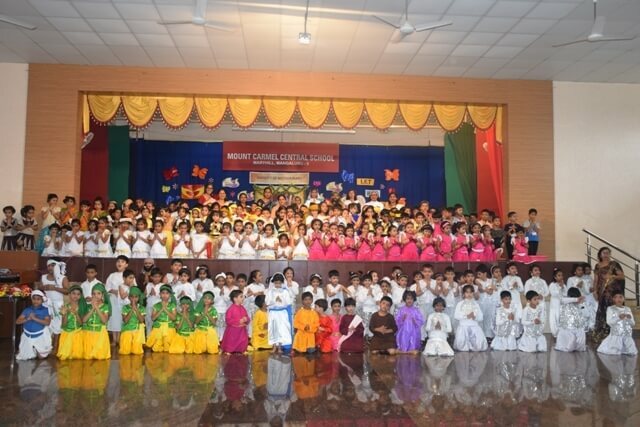 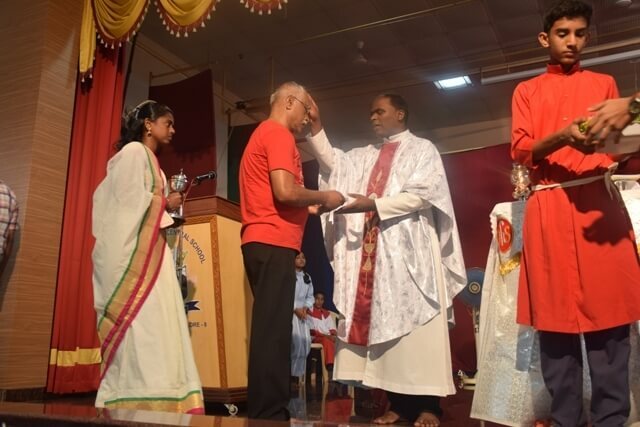 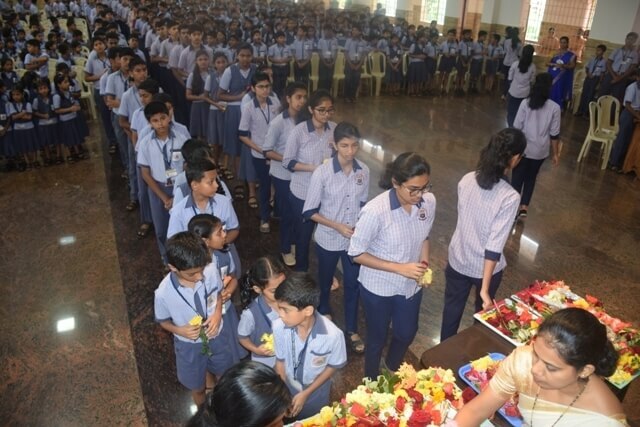 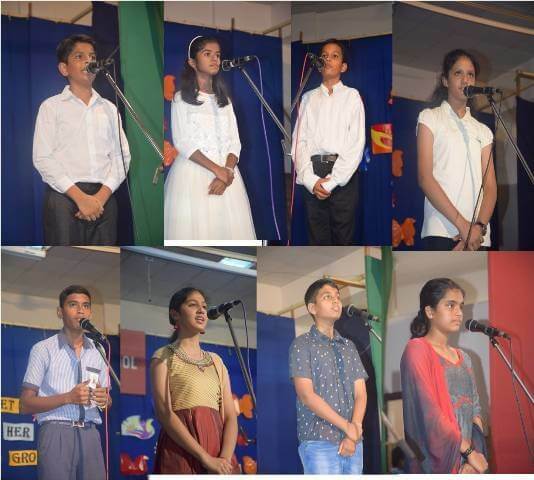 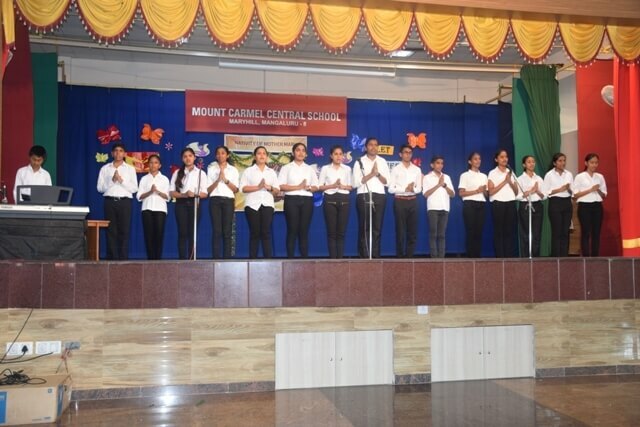 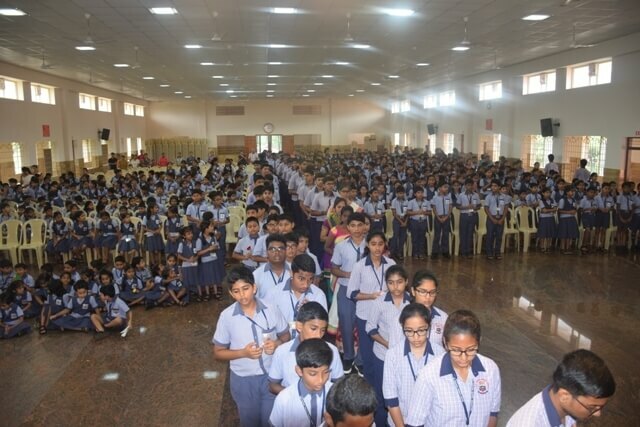 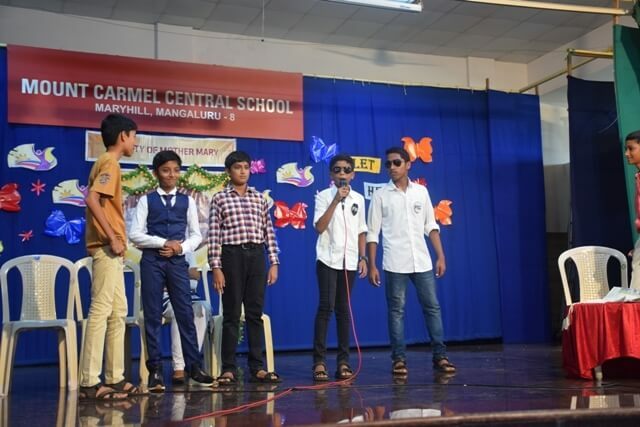 The finale was a scene to be remembered where students offered flowers to Mother Mary in love and reverence with the Konkani hymn “Moriek hogolsiyam” sung by the school choir. 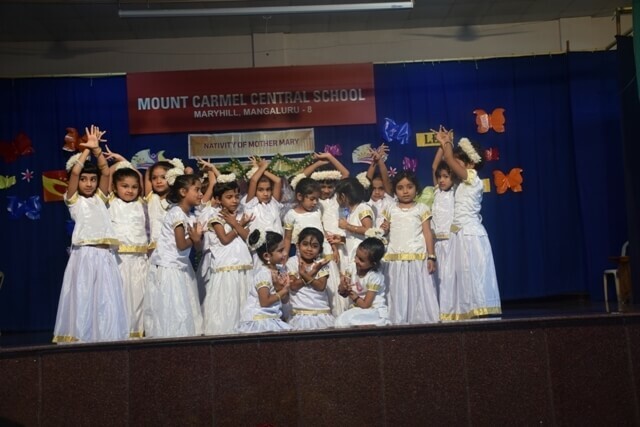 The Onam Pookalam prepared by the Kindergarten teachers and students was the attraction of the day.